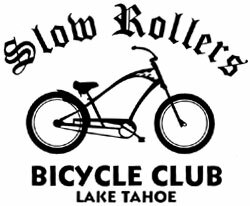 The Slow Rollers Bicycle Club of Lake Tahoe. Not only do they have fun, but all the money they raise at their events and merchandise sales goes to the Bikes for Children Program. The program buys new bikes for underprivileged children and local youth groups. They say becoming a member is a slow process. Just roll into any event and ask for more information.